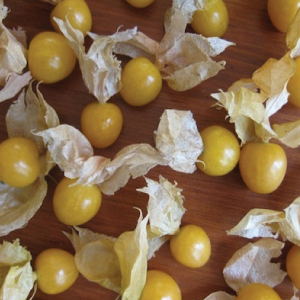 (Physalis) Husk Cherry is native to warm temperate and subtropical regions of the world. Husk Cherries produce cherry sized orange fruits that are enclosed by a large papery husk. Eat fruit fresh, turn into salsa, or preserve. Goldie Husk Cherry is tasty heirloom that is known for its very sweet flavor and ripens to a lovely orange and is best enjoyed in pies.